**Gatefold 2LP with liner notes and original artwork. 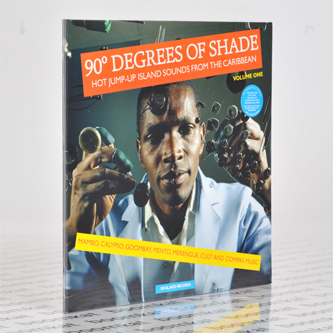 Includes download code** Soul Jazz present a sterling, 17-track audio accompaniment to their 100-page book of photography '90 Degrees of Shade'. Mambo, calypso, goombay, mento, merengue, cult and compas music from the '50s and '60s all come under the banner 'Hot Jump Up Island Sounds From The Caribbean', providing an authentic soundtrack to the archival photographs of local performers and rich, white westerners holidaying in Cuba, Jamaica, Haiti, Puerto Rico, Dominican Republic and more, shot over 100 years. The lyrics are often fxxking filthy in the funniest way, and the music is always fire, inspired by a dense and turbulent political, social and economic history towards an ultimate function. The recordings themselves, sometimes drenched in epic reverb as with the amazing, driving bomb from The Eloise Trio, or Peanuts Taylor's 'Nassau Blues', are just deadly - crackling with virile, hedonistic and complex polyrhythms and steeped in indigenous tradition, itself a melting pot of African and American cultures, and the cultures of Dutch, French, Spanish and English slavers. With hindsight, the music evidently still stands proud. Dem drums!